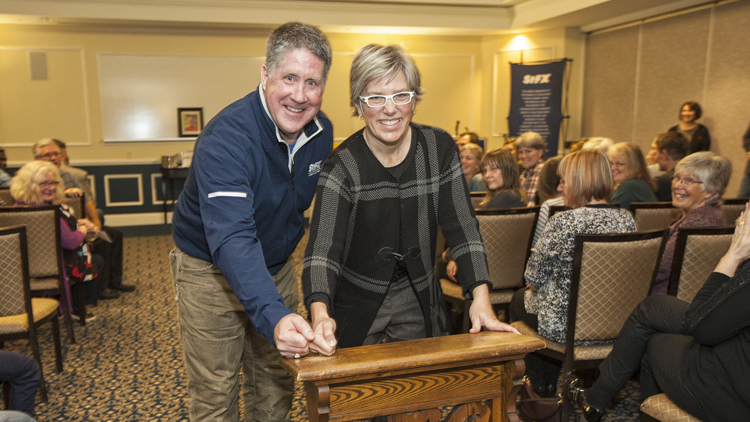 StFX President Dr. Kent MacDonald (left) and Anne Armstrong, wife of the late Kevin Fraser, tap the honorary X-Ring presented on behalf of Mr. Fraser on a kneeler from the University Chapel, a long held tradition at StFX. In his 15 years working at StFX with Sodexo as the general manager of food services, the late Kevin Fraser touched many lives. On Saturday, Nov. 3, colleagues, friends and family gathered at StFX’s Keating Centre for a special presentation to remember and celebrate these contributions, presenting Mr. Fraser’s wife with an honorary X-Ring on his behalf. 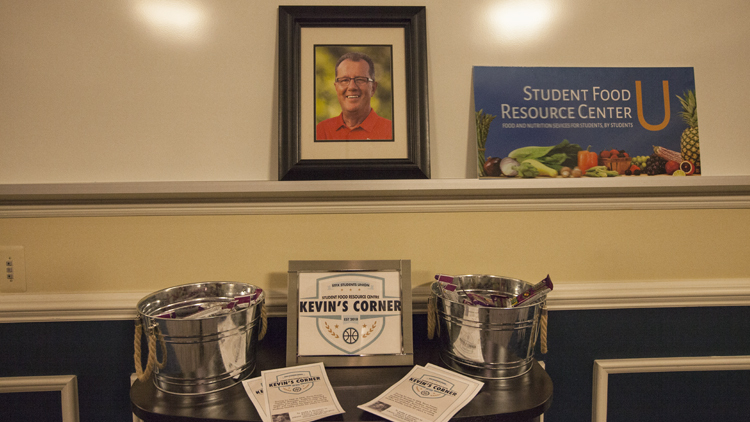 The event also launched Kevin’s Corner, which will continue his legacy at the Student Food Resource Centre, providing students with healthy snacks. During his time at StFX, Mr. Fraser, impacted students every day, including his deep support of this free, confidential and accessible service aimed at providing all students with the resources to manage a sufficient, healthy diet. “Kevin was a true Xaverian. He always went above and beyond to help the university and more importantly, the students,” said Bob Hale, StFX Director, Ancillary Services. “Kevin exemplifies who should wear an X-Ring,” Dr. MacDonald said as he presented Mr. Fraser’s wife Anne Armstrong with an honorary X-Ring. Daughter Allie and Mr. Fraser’s sisters were also in attendance. Dr. MacDonald noted there is a very formal committee that thinks very carefully on who receives an honorary X-Ring, given annually to a member of the StFX community who epitomizes Xaverian values. “Over and over, he made everyone’s day,” Dr. MacDonald said as he reflected on how Mr. Fraser knew what it meant to be part of a community. Dr. MacDonald said the X-Ring is normally presented during the annual ceremony held on campus on December 3, the Feast Day of St. Francis Xavier. “It will be a joy to recognize Kevin with all the other Xaverians who receive their X-Rings that day,” he said. Students’ Union General Manager Sean Ryan, Students’ Union President Rebecca Mesay and Students Union VP Finance and Operations Tega Sefia all acknowledged what a great friend and co-worker Kevin was, remarking on how much he meant to everyone. “Students were touched by the work he did,” Ms. Mesay said as she recalled how he was always so keen to say hello to students as they entered meal heal, to look after any food allergies, and to exemplify service leadership. “His impact is being felt, and will always be felt,” she said. “Kevin’s Corner is a great way for us to remember our great friend,” said Mary Jessie MacLellan, Associate Registrar, Recruitment, and the event’s host, as she invited Mr. Fraser’s friends and colleagues to bring up candles to form the shape of an X in his memory. “StFX is rich with tradition,” she said noting the kneeler brought in from the StFX Chapel. When the X-Ring ceremony was still small enough to be held in that space, students traditionally tapped their new X-Rings against the wooden kneelers. This tradition carries on today as kneelers are brought into the Keating Centre each year during the ceremony. She invited Dr. MacDonald and Ms. Armstrong to tap their rings on the kneeler as the ceremony concluded.